Loyalist Michael Stone planned to slit the throats of Sinn Fein's Gerry Adams and Martin McGuinness when he stormed the NI Assembly, a court has heard. 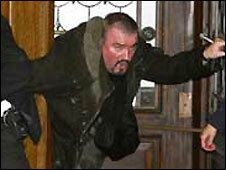 He has claimed his November 2006 action, which saw him detained by security staff, was "performance art". However, prosecution told Belfast Crown Court when arrested Stone told police he planned to kill the Sinn Fein men. His trial at the court, where he denies 14 charges including attempted murder, was later adjourned for a week. Charles Adair QC said that after his arrest, Stone said: "My intention was to walk into the debating chamber and look for where Adams, McGuinness and Sinn Fein were sitting. "I would have lobbed several nail bombs to cause confusion. I planned to stab Adams and McGuinness and cut their throats." During interview Stone said the prominent republicans were "war criminals" and that he just "can't handle" republicans being in government. The lawyer said Stone - who suffers severe arthritis and walks with a stick - spent two hours working his way through the Stormont grounds to the entrance of Parliament Buildings. 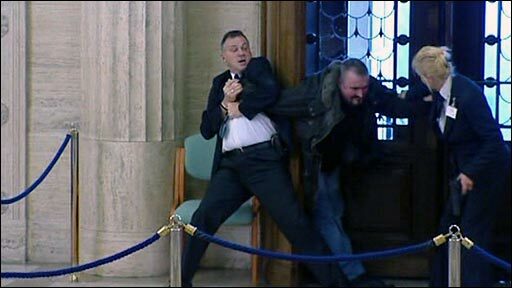 After being trapped by a security guard in the doors of Stormont he lit a fuse on a bag he had and threw it into the hall, shouting that it was a bomb. The device never went off and is believed to have malfunctioned after having got damp during the torrential rain that fell that day. Stone said he had been acting alone telling police: "I am a dissident loyalist freelance." The court heard that evidence, including a DVD of events at Stormont, had just come to light which both prosecution and defence would be using in the case. Arthur Harvey QC, who is defending Stone, said it would be used by him to back Stone's assertion that his actions at Stormont were performance art. He said the DVD was of very variable quality and it was not possible for Stone to view it in prison. It was agreed that the courtroom would be opened for Stone and his defence team to view the video on Tuesday and the case would remain adjourned until next week to enable the defence to consider the content. They would also be examining X-rays and photographs of the devices Stone was accused of carrying to determine their potential. They, too, had just come to light, said the judge, Mr Justice Deeny. As well as the attempted murder charges, Stone is charged with possessing home-made explosives and an imitation gun with intent. He is also charged with carrying a garrotte, three knives and an axe and assaulting staff members who trapped him in the revolving doors at Stormont. Stone, 53, has been in custody since the Stormont incident when the government cancelled the early release he received under the terms of the Good Friday Agreement following his life sentence for a triple murder. In 1988, he launched a gun and grenade attack on the republican funeral of three IRA members shot dead by the SAS in Gibraltar. Three people died and several more were injured before Stone was arrested by police as he fled Milltown Cemetery in west Belfast.